In 1652 the first purchase of land from the Indians of the Esopus is recorded with its acceptance by the Commissary and Vice Director of the Dutch West India Company at Fort Orange. This was to Thomas Chambers. The fact that he was permitted this settlement and ownership right is a significant statement. At this time most sizable land tracts were still in the possession of businessmen backers of the Dutch West India Company; burgers of the Netherlands that had never set foot on New Netherlands soil. Thomas Chambers was not only a simple carpenter and farmer, he was also English by birth, arriving in the New Netherlands as a paid mercenary. This deed could have signaled a major policy change toward independently owned farming settlements in the mid-Hudson region. More likely, though, it represented a blatant move to place an obstinate personality in the face of the Warranawonkong to test them. When this deed was given to Chambers others in the same area were being written mostly to those of the more traditional landholder class. Among the names on these deeds are two of perhaps greater importance than Chambers. The first is Christof Davits who is granted deeds to a small plot of fertile land adjacent Thomas Chambers and also to the valuable landing on the Hudson River at the mouth of the Rondout Creek. Davits is an Indian trader with a reputation as a itinerant backwoodsman who is fluent in the native language but possessing little wealth. Like Chambers, he is English and arrived as a mercenary. It is most probable that he is the agent in all of these land transfers and that he and Thomas Chambers represent the lead assault on the dominance and aloofness the Esopus Indians had obstinately maintained during the preceding decades of warfare between the Dutch and other Indians. The second name is that of the Director General of the colony, Peter Stuyvesant. His name is found indirectly at first referencing lands worked by Jacob Jansen Stoll overseeing “servants” supplied by Stuyvesant. Later large tracts would be under the name of his brothers, Balthazar Laser and Nicolaes Willem Stuyvesant. An idea of where this land actually was can perhaps be gained from a later event and an association with legend. In 1669 the Indians of the Esopus brought suit against Chambers for not paying them for the land purchased in 1652. Since a deed proving that a payment was made existed, this suit clearly addresses the fact that the land occupied was not that sold. Legend states that Chambers' party first entered their lands in 1653 by traveling from a landing at Saugerties southwest following the Esopus Creek to where they settled. It is possible that Chambers' deed actually described land between a northeast point closer to this landing at Saugerties and extended southeast to a point considerably north of the fertile Indian maize plantations around present day Kingston and Hurley. In this case the Warranawonkong would have placed the sale within allocated lands that they had honored from the time of the compact they perceived they had with Henry Hudson in 1609. These lands would actually be referenced in the final treaty after the Esopus Indians had been fully displaced twenty years later. It is very likely that once Chambers arrived at his land, the settlers rejected it in favor of the most promising land for immediate productivity, even if it were not what the Indians had sold. There is actually little doubt that Christof Davits would not have known the real location of the purchase or that the Esopus Indians could have conceivably sold and relocated from their most productive fields. It is possible that the final settlement site so near the Indians' homes, stores and plantations was intentionally chosen as a direct incursion and provocation by both Chambers and Davits. By 1657 there were between 60 and 70 inhabitants on 23 individually deeded parcels in the Esopus. Over 300 acres had been sown in grain. There were misunderstandings and conflict between these settlers and the Indians from the beginning. The very first related to an expectation that the ox and plow technology would also be used to benefit the Indian's fields. Also, the cattle of the settlers was allowed to graze on the Indian fields while 12,000 acres of the most productive land was fenced and said not to have been put into production or used for cattle grazing. (This was actually the deHulter tract planted with the unfamiliar wheat crop). In very early documentation a ransom is paid for a captured settler, a traditional method of negotiating a grievance. In every complaint of the Esopus Indians to the colonial authority there is documented the issue of whites giving liqueur to their youth making it impossible for the elders to control them. It would be the accidental killing of a settler by a visiting Neversink Indian, drinking with the local youth and displaying his banned firearm, that would bring these clashes to a crisis point. By May of 1658, when friction became intense, Thomas Chambers convinced the authorities at New Amsterdam that protection against the Indians was necessary because the crop of his settlement was large enough to be critical to the welfare of the entire colony. Director-General Stuyvesant, immediately, during that month of June, fortified the new settlement with troops and built a stockaded village with a garrison house for the militia. He made all the settlers move their houses into the village. This is the beginning of present day Kingston. He also built a barn for himself on his own land and annexed to the site of the village, which itself had been given as a gift by the Esopus Indians in an attempt to settle differences, all the land he could see from the stockade parapets ”suitable for fifty bouweries”. The “taking” of this non-gift land without the required gift in return was the reason for an uprising which followed called the “First Esopus War”. The Warranawonkong regarded stockaded settlements a threat. With their canon and firearms they were a brazen display of power in the midst of their territory. After the first Esopus War the center of population in the Esopus officially became named Wiltwyck and it was considered unsafe for any settler to make a home far from its stockade and military garrison. Overcrowding of Wiltwyck led to creation of a new center, Nieuwe Dorp (new village) at Hurley in 1662. The stockading of New Dorp was the cause of the Second Esopus War. This land was not paid for and it extended a militant presence farther into the Indian plantations and right to the edge of their main village. With their destruction of New Dorp and the massacre at Wiltwyck in 1663 that began the Second Esopus War the pursuit of the Indians that followed led to the discovery of the most remote plantations and villages of the Warranawonkong. New Paltz and Kerhonkson were founded in the valleys of the Wallkill and Rondout in the area of their “Indian Castle (fort)” sites that were ceded in the treaty that ended this War. The interest of the early settlers, through purchase and treaty, generally followed the cleared planting fields of the Indians into the creek-bottom valleys to the southwest. The Esopus Indians and the Dutch shared the same cultivation preferences and always planted low, bottom lands. Between the first settlement after 1653 and the end of the Second Esopus War in 1664 the Dutch continually appropriated the cleared land of the Indians ready for the plow. With this advantage the “granary” of the Esopus territory staged itself to be the most productive in all of the New World. This was impressive enough to become the main cause of an end to Dutch rule and for the colony to become English in 1664. The Dutch and the English were rivals for the trade of the slave-produced sugar from their respective Caribbean island plantations. When the English Crown was restored to Charles II in 1660 there was an immediate need to restore also the treasury. Appropriating a much needed food source for the growing numbers of slave workers of the English plantations while depriving the Dutch of the same source for their competing plantations was the solution. In March of 1664 Charles II officially annexed New Netherlands as a British province and granted it to his brother James, Duke of York and Albany, as Lord Proprietor. The English had "sea to sea" claims of the entire east coast of North America based on John Cabot's 1498 voyages. With a fleet under the command of Sir Richard Nicolls the Dutch colony was seized and by late September, 1664 New Netherlands had become New York. Within a month of his arrival Nicolls placed a garrison of English soldiers in the Esopus. As this was just at the end of the Second Esopus War the peace was confirmed as the “Nicolls Treaty”. The terms of this treaty and the disposition of the English soldiers at Esopus punctuated the fact that the Dutch and the English were at war. The Esopus Indians were treated as allies against the Dutch and their rights were considered of equal or greater importance than those of the Dutch inhabitants of Esopus. This attitude toward the average Dutch inhabitant by the English continued well after the hostilities between the two nations in Europe ceased. Since the principal reason for seizing the colony was the grain production of the Esopus priority was placed on stabilizing this settlement and encouraging its productivity. The placing of as many farmers as possible immediately onto the tillable fields was the policy behind granting deeds. The ceded lands of the Nicolls Treaty were basically those disputed lands that had caused the Second Esopus War. These were around Hurley and southwest following the Esopus Creek. In 1668 Nicolls named these the first and second “Great Piece” and proposed their division into 30 acre tracts with separate house lots in a village and the remainder of the wooded land as a commons. 1669 the British governor that replaced Nicolls, Francis Lovelace, had these lands surveyed, divided into lots and distributed between the English soldiers of the garrison that arrived with the seizure from the Dutch. At the same time he confirmed the bounds of the many farmlands of the founding settlers of the Esopus and the occupied Nieuwe Dorp lands. With the completion of this survey, official English “Towns” to be governed under “Dukes Law”were established for the new and existing population centers. Wiltwyck was made into a Town and re-named Kingston. Nieuwe Dorp became the Town of Hurley. South of Hurley a new center was created and called the Town of Marbletown. Between the introduction of the English garrison in Wiltwyck and this creation of the Towns in 1669 there was continual conflict between the Dutch planter population and the English soldiers. With the Nicolls proposal for distribution of the ceded lands in 1668 the germ of an ethnic division appears. The English are to settle southwest of Hurley and the Dutch from Groote Esopus (Kingston) north. When the court of Kingston in 1669 confirmed a settlement area as a precinct of Kingston at the convergence of the Plattekill and Esopus creeks this is the first recorded land grant north of Kingston into the area that will be the town of Saugerties. This grant carried the name “Dutch Settlement” well into the 20th century. This northward expansion begins on April 9th, 1669, when a permit is given to construct a mill at a place called “Dead Men's Bones” located a mile above the “footpath leading to Albany” crossing of the Plattekill. At the same session of the court granting this mill site the farm fields below it at “a certain neck of land five miles distance from Kingston and over the Kill near the footpath leading to Albany containing about 54 acres of good and clear land” was also granted provided that all the grantees build their houses together “on the other side of the Kill due north from the land of Thomas Chambers” so as to make a “township within the precinct of Kingston”. This “township” is today Ruby on the Ulster side and Plattekill on the Saugerties side of that Plattekill crossing. The “township” was centered on the innship of Jan Burhans, a commissary of Kingston, and Jan Oosterhaut. The mill was that of Tjerck Claesen de Witt, also a Commissary, and Willem La Montagnie, the teacher in Kingston and its Secretary of the Court. These are all prominent Dutch names well established before the English period. A noteworthy inclusion in this “Dutch Settlement” grant is the “desire” of Thomas Chambers, the most pre-eminent of the original planter class (and of English ancestory), to build a house for a servant and one for his son-in-law (possibly his step-son of Dutch ancestory) in this same neighborhood. Thomas Chambers was to receive a manorial charter on October 16th, 1672 under the title of the “Lordship and Manor of Foxhall”. This “considerable Estate” was later enlarged yet more with the granting of an additional 300 acre tract in 1686. The bounds of this manor have never been precisely defined so the wording of the 1669 “Dutch Settlement” grant may be an indicator of its extent beyond the farm lands he first plowed as founder of the original Esopus settlement fifteen years earlier. The locations and periods of Thomas Chambers' acquisitions may also be taken as guideposts to a course of events that forms the northward expansion of the original planter class of the Groote Esopus. In the early stages of this northern expansion the Groote Esopus experienced a brief return to Dutch rule. In the summer of 1673 New York was taken by Anthony Clove under the flag of William III of Orange, Stadholder of the United Netherlands. New York was again New Netherlands until early fall, 1674 with the arrival of New York's new governor, Edmond Andros, Lord Salisbury, representing James, Duke of York, after the Treaty of Westminster. With this treaty the Dutch and the English were no longer at war, the colony was once more English and the peace meant the garrison at Kingston was permanently disbanded. By 1677 the earliest claims of the original Dutch inhabitants of the mid-Hudson valley were finally recognized and confirmed as deeds and new patents were being granted over the entire region. At this time the Court of Kingston, which was comprised mostly of Dutch planters, sought the surrender of all the Esopus Indian land that remained both south in the New Paltz area and north in the Saugerties area. 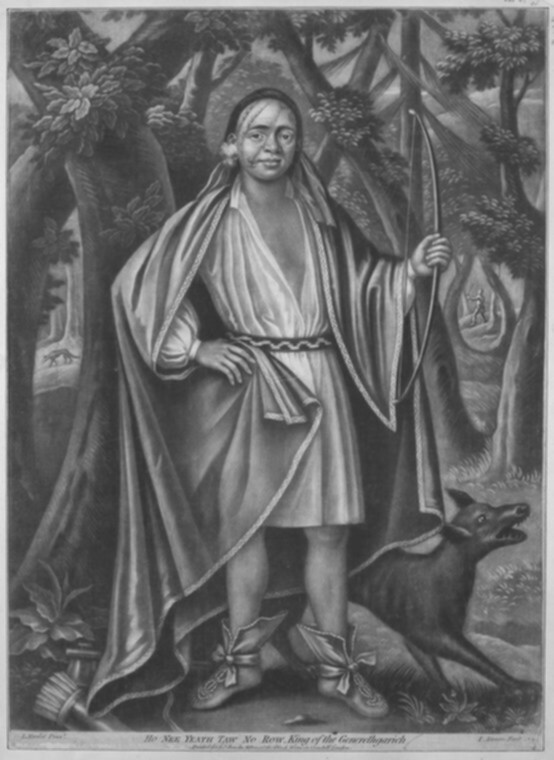 The Lenne Lenapes, further threatened by the agreements between Andros and the Maquas during the Indian wars in Massachusetts in 1675-76, supported the final transfer of any remaining Minsi land to the English. On April 27, 1677, the Warranawonkong released to Governor Andros all their rights to the northern territory of the Esopus. The following day Andros gave a license to twelve individuals to purchase from the Indians their remaining southern lands around New Paltz. By 1683 the entire colony of New York was comprised of 10,000 inhabitants. 3,000 lived in and around Manhattan and 2,000 lived in the Esopus with the rest scattered in the Albany area and in the towns of Long Island. The grain shipped from the colony to the plantations of the Indies was 60,000 bushels, all ground, packaged and transported by the population of Manhattan but mainly grown in the Esopus fields of Kingston. With this increase in both population and commerce the colony's new governor, Thomas Dongan, was directed to organize New York into administrative districts. The name used in this document and others that closely followed it; "Sagers" Kill, "Saeger's" Kill and "Sawger's" Creek; illustrates the early transition from Dutch to English of the name (ignoring the Algonquian). By 1687 the term "in the Sagiers" (yet another transitional spelling) appears as an official location in the patent descriptions for the earliest land transfers using the mouth of the Esopus as a reference. James, Duke of York, became King James II in early 1685 with the death of his brother, Charles II. This immediately made his proprietary colony into a Crown colony. Those with influential relationships in the court of the king immediately began to petition for patents to the newly available Crown lands. George Meales and Richard Hays petitioned the Crown for a patent to lands in the "Sagiers" in 1685. These lands totaled 1,194 3/4 acres. At about the same time another large patent petition was placed for 797½ acres to the north at a location called Wanton. The petitioner was Robert Fullerton who was also the surveyor for the Meales and Hays lands. Finally, the largest petition was made in 1686 by William De Meyer and Jan and Mattys Mattyson representing 12 individuals in all. This was subsequently granted in 1688 as the northern part of the much larger Kingston Patent. That petition essentially covered all the lands of the Andros Treaty with the rest of the Kingston patent lands stretching all the way south to the New Paltz patent. On May 31, 1687 the Meales and Hays patents were granted. The Fullerton Patent was granted on January 9, 1692. These were probably at the time considered to be in the County of Albany as the Kingston Patent was the northern-most grant in the County of Ulster. Two major Indian wars were fought in the Esopus between 1659 and 1664 as the European settlers and their fields spread. It was not the sharing of land that caused the problems. The horses, cows and hogs of the settlers in the open Indian fields, the settlers' fencing good land and not planting it and the building of the village stockade directly atop the pathway of the ancient Indian trade route did stress the Indian's sense of fairness and reverence for their land and traditions. Rather, relative to the ancient trade route, the primary cause of the wars was the acceptance of the Dutch of the visiting and traveling of their friends, the Maquas, on this pathway and over the lands of the Esopus. The main cause of the Second Esopus War and the massacre that initiated it was the haughty statement of the Maquas in January of 1661 that they would pass to the South River on this pathway and make war if prevented on the Esopus Indians. The Dutch had heavily armed the Maquas and refused to arm the Lenni Lenape. The Warranawonkong were always the protectors of the Hudson River terminus of the great pathway of the Lenni Lenape people whose primary Council Fire was on the South River. Removal of the Dutch from their territory because they facilitated Maqua access to this path was a duty to their “Nation” since the Dutch presence signified that all of the Lenni Lenape people were dominated by the Maquas. In the final analysis, it was not the Dutch that wiped out the Warranawonkong. They had few military encounters with this highly populace, war-trained race. Rather, it was with the help of Maqua informants that the Dutch destroyed the crop stores of the Esopus, Rondout and Wallkill plantations. This left the Warranawonkong to starve and become easy prey for the Maquas. At the end of each of the Esopus wars more and more Indian land was ceded “by conquest” to the Government of New Netherlands until there was little good land between New Paltz and Saugerties that the Warranawonkong were allowed by their conquerors to cultivate. As this agrarian people was forced to retreat to the mountain valleys they rapidly lost their standing of dominance and the Maquas of the north subjugated them. Within the next fifty years their identity was completely lost, as was the greater part of the Munsi clan. Eventually the Council Fire of the once great Lenni Lenape Nation was extinguished. Even the most remote ceded lands at the Esopus, Wallkill and Plattekill headwaters had been divided among the Dutch and later English farmers and soldiers so that there was not an unoccupied place for them to visit for attending to their traditional rituals to honor their long husbandry of their lands. It is said that well into the late 19th Century a single Indian would appear and camp every year between the planting and harvest times wherever allowed on the strand at the Rondout. At times it was an old squaw with a young male. The reason was unknown at that time but was likely the fulfillment of a combination of deep-set religious ritual and a treaty obligation. At the end of the Second Esopus War the terms of the treaty with the Dutch and the Nicolls Treaty required that an Esopus Indian elder, with some chosen youth of the people to witness, appear and reaffirm the peace each year at Kingston. A dwelling place for the Indians to house themselves on the strand was also provided in the treaty “over the kil, where they can remain”. It is recorded that a hundred years after the original treaty a destitute band of Indians living among the Mohawks asked for help of the government to cover the expense of their journey to Kingston to fulfill this treaty obligation. The Indian visitors that appeared over a hundred years after this may have been from some remote remnant of this presumably extinguished race faithfully fulfilling this annual pilgrimage out of honor and as part of a ritual process unremembered by their negligent western conqueror. 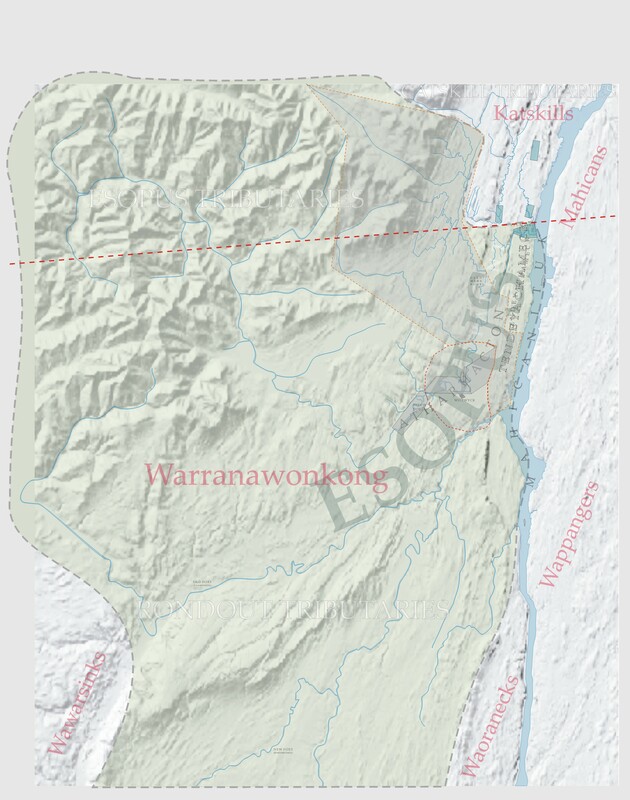 The document that surrendered the northern lands of the Warranawonkong, called the “Andros Treaty”, originally covered the area that is now the western half of the present town of Saugerties. It conveyed all the land “from the Ronduyt Kill till a Kill named Kahakasinck northward along the mountain ridge to a Kill named Magowasinck, thence to the second Falls, toward the East till Tendeyachameck on the Great River, southward along the river till the Ronduyt Kill with everything included in the same, good and bad, mountain and valley, waters etc.” In Indian place-names this wording describes the Sawkill to its source at Shens Lake (Echo Lake) on top of Overlook Mountain, along the ridge to the source of the Plattekill, down the Plattekill to the Glennerie Falls, east to below Turkey Point and then the entire river frontage south of this to the Rondout outlet. It does not include the land of Saugerties between the Plattekill and the Hudson River or the Indian lands known as Tendeyachameck. Tendeyachameck is the land that today comprises the Flatbush/Glasco/Barclay Heights area of the southern corner of the Town of Saugerties. The word itself means Flatbush. It is the plantation land referred to in Robert Juet's journal entry of 1609 as the home of the Indians Henry Hudson visited two leagues south of the Half Moon anchorage on the river. These are the same Indians that were trading their grain at the Rondout landing after the hostilities of the Second Esopus War and those referred to as peacefully planting in Captain Cregier's journal during the war. To cover this discrepancy in the treaty the Court of Kingston recorded what can be considered an addendum. The day after the Andros Treaty, Kaelcop, a sachem of the Esopus Indians at Saugerties, agrees that ”the limits of Kingston or the Land of Esopus shall extend Northward to the Great Falls of the Kill which appears there named Fendeyackameck in the language of the savages and the "Sagers Kill" in the Dutch language, along the mountains below which runs the road from Katskill." This language encompasses all the land from Turkey Point north to the mouth of the Esopus Creek and west to the Plattekill Creek including all of the Churchland. This made all the land of the Indians north of what they had supposedly deeded a quarter century before open to colonial expansion. It was in this “clarification” of the 1677 "Andros Treaty" that mention was made of the lands given by the Indians to the "Old Sawyer". The Sawyer's was all the lands between the lands described and the lands of the Katskill Indians and included the Sawyer's rights to the Kill, or the "Saeger's" Kill. It is noted in this treaty that the term "Sagers" and "Saeger's" both represent the mouth of the Esopus Creek at Saugerties. In the Algonkian language this name would translate more as a description of this mouth, “Saugus”. But there still remains a long tradition that “Sagers” was actually a name that referenced the “Old Sawyer” of the 1677 addendum and that Saugerties is named after him. At the time of the Andros Treaty there is no record of settlement or homesteads in the area of either Tendeyachameck or this addendum part of Saugerties. A deed written ten years after this time does reference previous habitation near or around the mouth of the Esopus. John and Johanna Wood were deeded their already improved homestead on November 22, 1687. This was all the land from the bend of the Esopus above Stony Point eastward to the Hudson River and bordered north by the Esopus Creek. They have a house, herd pens, gardens, orchards and conveyances to a sawmill already built on this site according to the wording of this deed. A 1705 deed granting land at the wagon road that crosses the Esopus above the falls at Stony Point places the location of John Wood's homestead house on this road at what is now called Esopus Bend. The conveyance to a sawmill would thus have been from above the Stony Point fall to a mill site in an area below later flooded by the Barclay dam of 1825. This sawmill could have made the Woods the “Old Sawyer” of the Tendeyachameck reference. However, a recent discovery – a period listing of a history timeline from 1770 – puts to rest this question, giving “Pet” Winne the distinction of being recognized as the Sawyer in a reference from a time closer to living memory. Or the treaty reference could have harkened back to a decades-old memory of a perceived agreement made at the time of the famous dinner on the Henry Hudson’s Half Moon. In any case, the Andros Treaty represents the end of Warranawonkong occupation of the land that had been their home for thousands of years.